Good Choice Reading: Review: Phoenix by Elizabeth Richards! 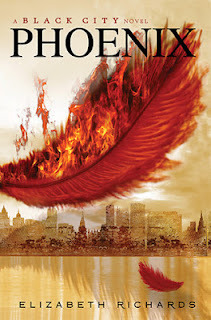 Review: Phoenix by Elizabeth Richards! This book broke my heart, tickled it, made it race, and broke it all over again. I love this series, no secret at all, but with the way things ended, I have no clue what to think. I am so torn, but so excited at the same time. Elizabeth Richards is such an amazing writer, and Phoenix was just as good as the first. Ash and Natalie will forever be my favorite book couple. I just love everything about them as a couple. Nothing really changes in Phoenix between them, except that their love gets tested, and their trust for one another. So much goes down and I want to share it all!!! There are some new characters that are introduced, secrets being revealed, a huge twist, tons of betrayal, and lots and lots of suspense. I literally wanted to bite all my nails off. The new characters worried me a bit. I didn't know who could be trusted, and at one point I really thought the story was leading up to a love triangle. Rest easy everyone. Even though it seems like there is one, there isn't. Not sure how things will turn out in book three, but from everything in Phoenix, I can say I doubt there will be one, which makes me super happy. No one can replace Ash. NO ONE! Phoenix delivered everything I wanted and more. I just cannot wait for the third book. It does have a sad ending, but one that leaves room for tons in the third book. I can only imagine what’s to come, and with Elizabeth Richard’s imagination, I am sure it will be just as raw and intense as Black City and Phoenix making it an epic ending. This is definitely a series I highly recommend. It does have to be read in order, though. Great sequel! I need to start this one soon! It just sounds AMAZING, and I loved Black City as well! I'm curious about the new characters now. Great review, Damaris!